An epic journey in East Africa, beginning with an adventure in the unspoiled forests of Uganda. Following this exhilarating adventure journey to Tanzania's famed northern circuit, for a safari centered around the legendary Serengeti. 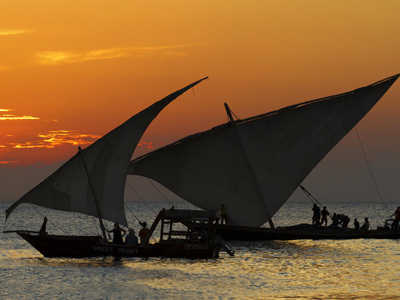 End your adventure with a relaxing yet fascinating stay on historic Zanzibar. Named one of National Geographic Traveler Magazine's "50 Tours of A Lifetime, 2014". Welcome to Uganda! 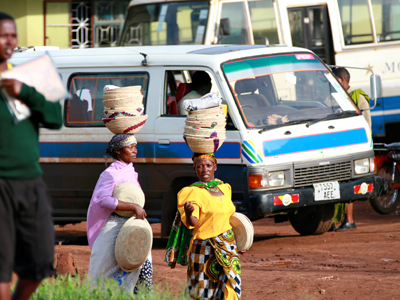 You'll be met on arrival at the airport and assisted through customs before starting your journey to the west via Kampala. 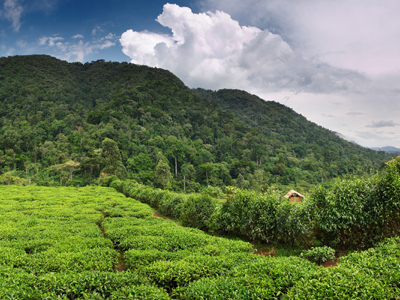 You'll be driven through the green tea plantations and the evergreen Kibale forest, arriving at Fort-portal in time for lunch. Afterwards, you’ll proceed to your lodge for your overnight accommodations. After breakfast, you'll be met and driven down to the Kibale Forest National Park, for primate viewing. The activity starts early in the morning. Your guide will help you search for chimpanzees and other primates within the park, as it is host to 13 species of primates. The guide will provide detailed explanations of not only the primates, but also of all the forest's fauna and flora, ensuring that your walk is both informative and enjoyable. This walk is excellent for viewing bird life and primates up close. After lunch, you'll head to the Queen Elizabeth National Park, following the mystical Rwenzori Mountain Range for most of the journey. A game drive en-route may be rewarded with views of waterbucks, elephants, leopards, buffaloes, hyenas and a variety of antelope species. After rising early this morning, and enjoying a cup of your favorite beverage, you'll embark on a morning game drive along the Kasenyi track and Queens mile while keeping an eye out for lions, elephants, Cape Buffalos, warthogs, leopards, hyenas, Mongoose, Waterbuck, Ugandan Kobs, and lots of other small animals and birds. After lunch, enjoy a unique boat cruise on the Kazinga Channel and into Lake Edward. This trip passes through high concentrations of hippos and a wide variety of animals that may be seen drinking at the water's edge. 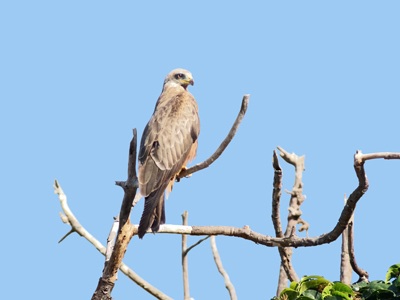 This river cruise offers an excellent platform for photography, bird watching and game viewing. 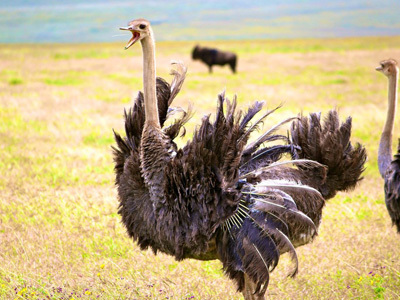 The prolific bird life is large and colorful with well over 600 recorded species having been spotted. Retire in the later afternoon to the lodge. After breakfast, you'll be met and driven to Bwindi via the Ishasha sector of the Queen Elizabeth National Park, which is famous for its tree-climbing Lions. As you drive along the road via the Ishasha sector you should see a multitude of animals. Arrive at the camp in the afternoon then relax around the camp. It's gorilla time!! Early this morning you'll enter the gorilla sanctuary nestled in the rainforest. This spectacular, heavily vegetated and dense landscape is crisscrossed by numerous animal trails, allowing access for trekkers to view the park's most famous inhabitants. 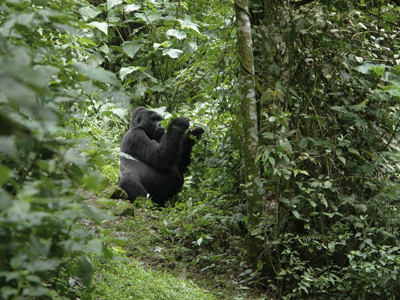 The terrain varies according to the movements of these amazing gorillas. Enjoy the thrill of observing these gentle giants up close and personal and in their environment. They are shy and peaceful animals and it is an unforgettable experience to watch and photograph them as they interact with each other. This rare and exciting adventure will leave you with long lasting memories of a truly unique experience. After an early breakfast (depending on your flight schedule), you'll be driven to the Kihihi airstrip. Depending on the weather, you may have the best views of the Volcanoes, villages and Lakes as you take off, arrive at the Entebbe airport for your connecting flight to Kilimanjaro. Upon arrival at Kilimanjaro International Airport, you will be met by our local representatives and transferred to your accommodations in Arusha. 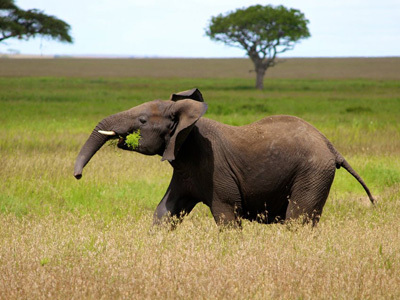 You'll transfer to Lake Manyara National Park and enter for game driving and exploration. 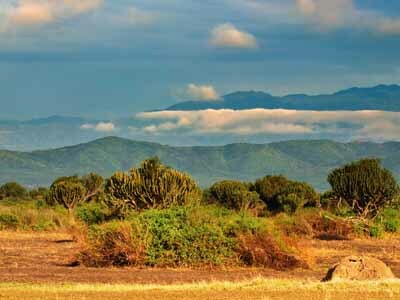 Lake Manyara National Park possesses unexpectedly striking settings and peaceful surroundings. Dramatically bordered by the sheer wall of the Rift Valley on one side and the shores of the lake on the other, this thin stretch of land hordes diverse habitats which in turn host a remarkable variety of wildlife. The open grasslands between the lake and the acacia woodland are littered with wildebeest, zebra, impala and giraffe as well as the country’s densest population of buffalo. Today you're in for an interesting cultural treat as you visit with a local Hadzabe tribe and join them for a morning of hunting and gathering. You'll have the rare opportunity to see how these extraordinary people live and join in the thrill of hunting small mammals and preparing them to cook. You’ll then head to the Ngorongoro Crater rim for your overnight stay. This morning you’ll descend into the Ngorongoro Crater floor for game driving and exploration. Ngorongoro was a huge active volcano, probably larger than Kilimanjaro when the volcano erupted some 8 million years ago. Its cone collapsed leaving a crater or more appropriately a “caldera” 600m deep, 16km across and 265 sq km in area. Many of Tanzania’s last remaining black rhino can be seen grazing on the open grassland of the crater floor surrounded by some of the 20,000 large animals that occupy the crater, including lion, cheetah, eland, zebra and gazelle. Flamingo, among other bird species can often be seen feeding at Makat Soda Lake. After a picnic lunch you'll continue on to Ndutu, the southern region of the Serengeti, for dinner and overnight. Enjoy the next two days game driving in the rolling grasslands of Ndutu, located in the southern region of the Serengeti. 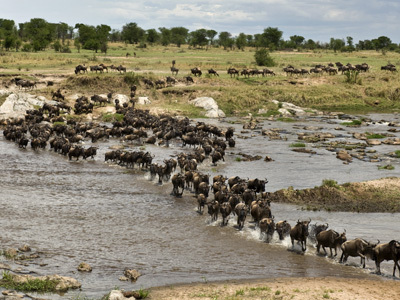 Criss-crossed with forested riverine valleys, the Serengeti plays home to millions of Africa’s large mammals, making this one of the world’s most famous wildlife destinations. The Serengeti National Park is probably the best place on the planet to spot large game. Your days here will be spent on several different game drives searching for prides of lions, cheetah, leopard and much more. In the evening return to the beautiful tented camp for stories and dinner. The Serengeti is calling again today! This morning you will embark on a full day of game driving and exploration. Lions, zebras, cheetahs, giraffes, various gazelles, elands, impalas and warthogs among other animals dwell in high populations within the Serengeti. 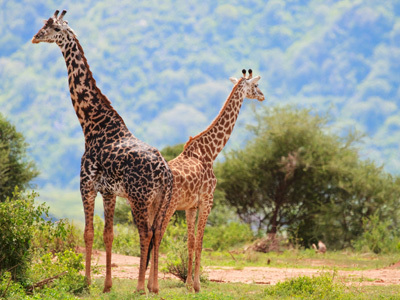 After your game drive you'll continue on to the Crater Highlands for your overnight stay. You'll have the early morning free until it is time to descend out of the crater highlands and on to Arusha Airport for your 1:00pm flight to Zanzibar. 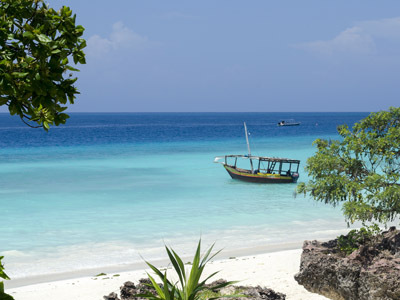 Upon arrival in Zanzibar at 2:35pm, you will be met and transferred to Matemwe Beach Village. 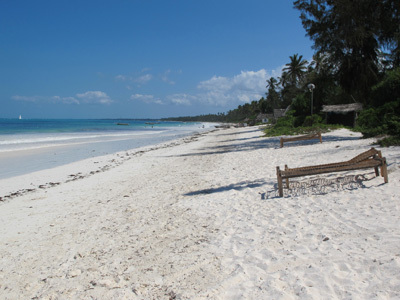 Matemwe Beach is a small guesthouse which is located out on its own on a long stretch of classic palm-lined, white sand beach on the the North East coast of Zanzibar Island. Just off-shore from the guesthouse is the world-famous Mnemba Atoll, whose circling reef has some of the best diving in East Africa. Along the beach from the resort are palm-thatched villages, where friendly local people live a traditional life dominated by fishing. Matemwe really is close to the classical notion of paradise. 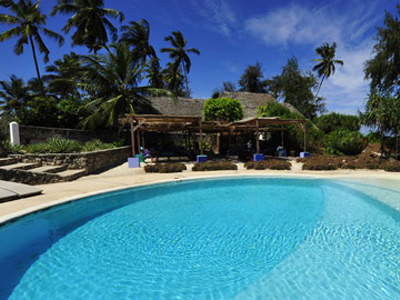 Enjoy the next two days at leisure in Zanzibar! 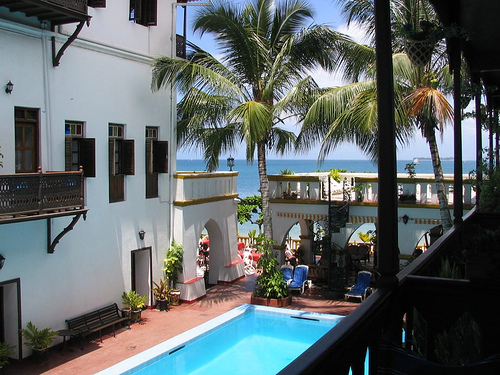 Today you will transfer to Stone Town for your last night in Zanzibar at the Tembo Hotel. 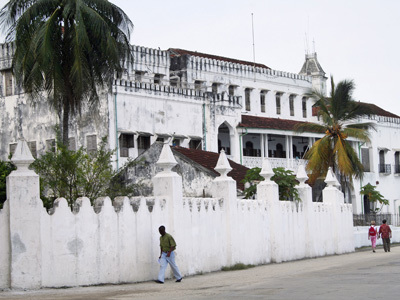 Stonetown is the historical capital of Zanzibar island, a wonderful tumbledown mess of palaces, bazaars and markets, and one of the most atmospheric and fascinating places on the whole Swahili Coast. Today you will be met and transferred to the airport to catch your flight to Dar es Saalam and your connecting flight onward (flight not included). We hope you enjoyed your amazing journey in Africa! Primate Lodge in Kibale is an exclusive eco-lodge situated in the heart of the Kibale Forest National Park. 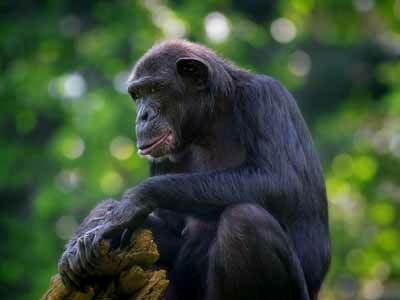 It is surrounded by a lush tropical forest that is home to 13 different species of primates, including the chimpanzees. Privately secluded in the rainforest, this safari lodge offers you a truly authentic jungle experience and is the perfect gateway for tracking the primates in Uganda. 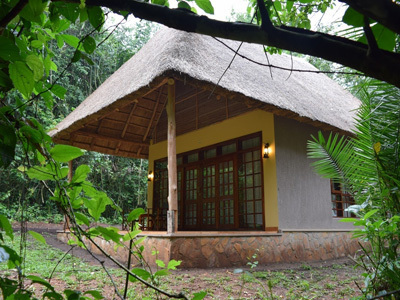 Whether you desire a high level of luxury and comfort, rather stay in a mid range cottage, or want to bring your own tent, Primate Lodge Kibale is the ideal place for you! So, forget about rushing for the morning chimp tracking. Instead, wake up with the sounds of the forest, enjoy a delicious breakfast and prepare yourself for an exciting meeting with the chimpanzees! Mweya Safari Lodge offers visitors an unforgettable experience. Located on a peninsula within the heart of the Queen Elizabeth National Park, the Lodge is surrounded by the magical Rwenzori Mountains, appropriately described as the 'Mountains of the Moon'. Each of the guest rooms at Mweya Safari Lodge boasts breathtaking views of the Kazinga channel. You can watch the forest hogs grazing the grass outside, as well as the odd curious hippo! Your stay here is sure to reward you with the unique experience of luxury in the wilderness. After your days of exploring, return to the property for a dip in the outdoor pool overlooking the channel. The incredible Silverback Lodge is perched atop the valley overlooking the Bwindi Impenetrable National Park. The view is absolutely stunning and the best place to enjoy an evening cocktail, after an adventurous day of tracking. Bird watching and sometimes primate viewing is possible right from the front door of your room. With only 12 rooms on property, this is actually the largest lodge in the area and remains one of the best value accommodations in the region, while maintaining high standards of comfort and hospitality. 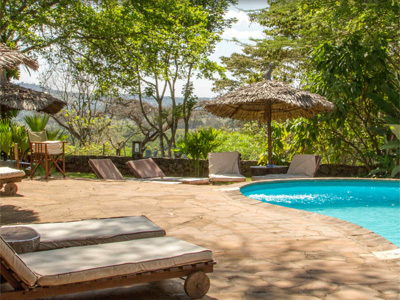 Kigongoni Lodge is located on an historic 70-acre coffee farm near Arusha, amid natural forest. 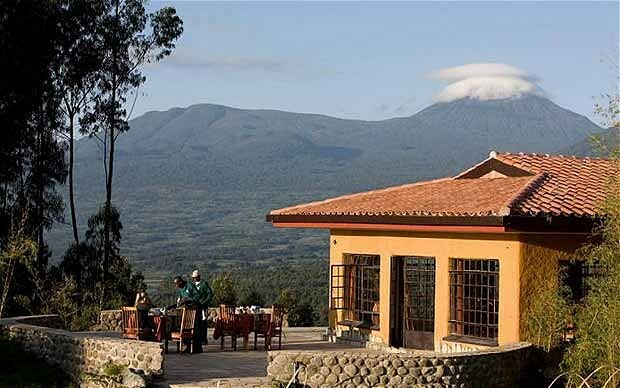 Sitting on a hilltop with lush gardens, the lodge offers breathtaking views of Mt Kilimanjaro and Mt Meru. 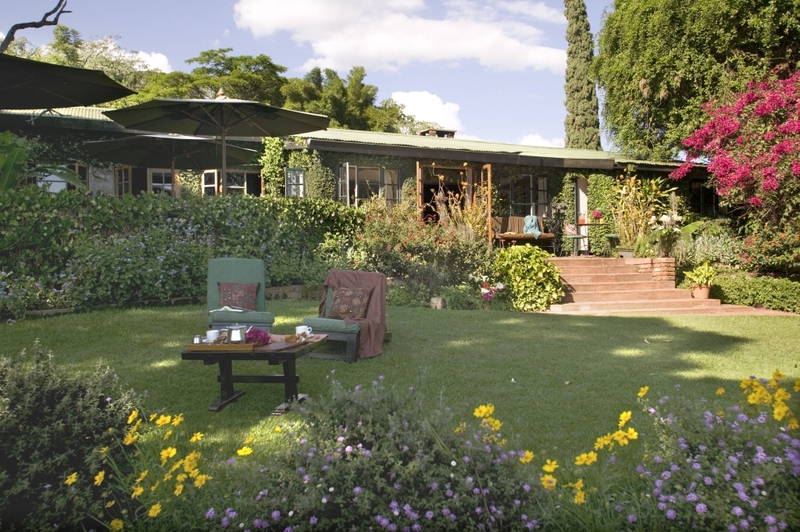 Tucked between the trees are eighteen cottages, built in traditional African styles and materials. The rooms, cocktail lounge, and restaurant - all with fireplaces – are furnished in an intimate and comfortable manner, maximizing the site’s unique views and natural features. Kigongoni Lodge has been developed in harmony with, and respect for, local community values, heritage and aspirations. The Sibusiso Foundation, a center for improving the quality of life for mentally disabled children and their families, has its home adjacent to the lodge. Staying at the Kigongoni will give you an authentic experience and true sense of Tanzania, while providing an opportunity to participate in activities that contribute to the sustainable development of local communities. Kisima Ngeda, a stylish camp that includes amazing cultural interaction opportunities, along with plenty of activities. 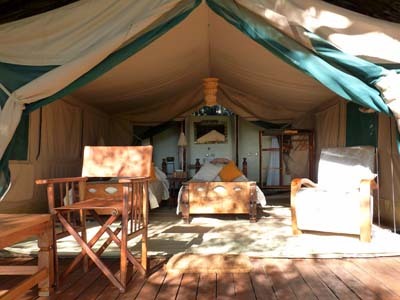 Located on the shores of Lake Eyasi, the camp offers stunning views over the seasonal soda lake looking up to the Ngorongoro Conservation Area on the one side and across to the Alipi escarpment on the other. Here one can enjoy the spectacular landscape as well as experience the daily life of the last few remaining hunter/gatherers the Hadzabe as well as their pastoralist nomadic counterparts the Datoga tribes. With 7 spacious tents with private verandahs overlooking the lake. Intimate dining overlooking Lake Eyasi. Kisima Ngeda’s décor draws on elements from the surrounding landscape and incorporates elements of traditional Hadza culture. Cozy lounge area is a perfect place to relax before dinner or with an after dinner drinks or takes a dip in the pool after a long day. 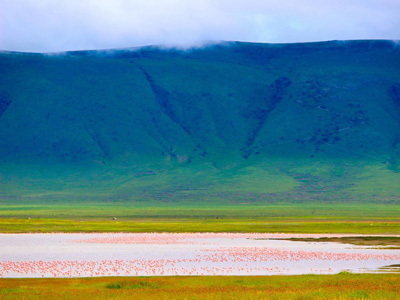 Perched on the rim of the collapsed volcano, the Ngorongoro Crater, a world heritage site, often referred to as the eighth wonder of the world. It has the most magnificent views over the crater floor, which is home to vast herds of buffalo, wildebeest, zebra, the rare and endangered black rhino, elephant, cheetah, leopard, lion and herds of gazelle and wildebeest. Its position on the Eastern rim allows the most spectacular and uninterrupted views of the sunset. All of the 91 double bedrooms are very spacious and each has two queen sized beds and a separate dressing area. Each room has a glass fronted veranda, where you may enjoy a private view of the Crater. The lodge also has 6 single rooms, all of which have a queen sized bed and glass fronted sliding doors. Matemwe Beach is a small guesthouse which is located out on its own on a long stretch of classic palm-lined, white sand beach on the the North East coast of Zanzibar Island. Just off-shore from the guesthouse is the world-famous Mnemba Atoll, whose circling reef has some of the best diving in East Africa. Along the beach from the resort are palm-thatched villages, where friendly local people live a traditional life dominated by fishing. Matemwe really is close to the classical notion of paradise. This is just one of many authentic travel experiences offered by Global Basecamps. If you are interested in more unique destinations to Uganda with unprecedented planning and extraordinary service visit our main Uganda safari page to browse other sample trips.